Should I wear a plantar fascia night splint? 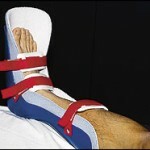 Should I wear a plantar fascia night splint ? One kind of Plantar Fascia night splint. This intervention is almost never required. To explain why, let’s recap the information found in the Plantar Fasciitis Info Sheet. You may recall that this kind of heel pain occurs when the fascial band is subjected to an excessive stretching force. This traumatises the ‘enthesis’, the place where the band splits up into thousands of individual fibres, puncturing the bone to take their attachments. Almost always, it is the pronated / rolled in / dropped arch foot type that leads to this elongation. As the arch lowers, the fascia band pulls tight. This happens because the start and end points move away from each other. This ‘stretches’ the tissue until the fibres start to tear which obviously causes the pain. This tissue is subjected each day to this excessive stretching force. If the (very strong) retinacular fibres that make up this tissue can withstand this stretching force for 10,000 steps you take every day under the full load of all of your body weight, it should be obvious that the gentle stretch afforded to the foot with virtually no weight applied to the stretch won’t have any effect. If the retinacular tissue could stretch, the foot flattening during walking is exactly what would make it happen. So night splints and plantar fascia socks are not, in my opinion, of any benefit in plantar fasciitis. Indeed, they often just make it more angry. The answer, as discussed in FAQ # 41, is to take the pressure off the plantar fascia to let the painful tears in the band heal.